The ejector pins are a necessary part of the mold and the molding process. They serve to “push out” the aluminum casting from the ejector side of the mold after the aluminum is solidified and the mold opens. After the mold opens in the machine the casting stays on the ejector side of the die since the part and drafts have been designed for this purpose. With the mold open there is a mechanism that will push a plate inside the ejector half on which all the ejector pins are attached. Once this plate moves forward, the ejector pins move forward simultaneously in one swift push. This action will push the solid casting out of the mold. Once out of the mold the casting can stay on the ends of the ejector pins and is picked off by a robot and removed from the inside of the casting machine and the cycle of making another casting will start. The movable ejector pins must be used to eject the die casting from the die casting die as previously described and will result in a residual ejector pin mark on the die cast part. 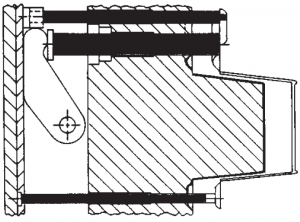 In addition to automatically pushing the casting from the die after part solidification, ejector pins also serve to keep the casting from bending. The sequential illustrations demonstrate the action of the ejector pins in a die casting cycle. Ejector pin locations should be at the option of the die caster, subject to the customer’s agreement. Where considerations of cast surface cosmetics are important, ejector pin locations should always be discussed in advance of die designs. The number, size and location of ejector pins and bosses required will vary with the size and complexity of the die casting, as well as with other factors. 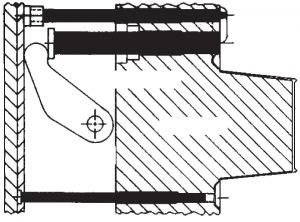 Ejector pin marks on most die castings may be raised or depressed .015” (.381 mm). Raised ejector pin marks are preferred for optimum production. Larger castings may require additional ejector pin tolerances for proper casting ejection. Ejector pin marks are surrounded by a flash of metal. Normally, ejector pin flash will not be removed, unless it is objectionable to the end use of the part. Alternatively, ejector pin flash may be specified as crushed or flattened. In the case of either non removal or crushing/flattening, flash may flake off in use. In the case of today’s electronics any metal flake of loose particles from the ejector pin flash need to be removed from the casting completely. This is another important point to discuss during the design launch of the project. Complete removal of ejector pin marks and flash by machining or hand scraping operations should be specified only when requirements justify the added expense. Even with a new mold there will be flash present to some extent on the ejector pins and will need to be addressed up front. As can be seen it is important to consult with your die caster in the early stages of a project on ejector pins as well as other critical design aspects of an aluminum die casting – drafts, radii, parting line location, core sizes, and surface finish requirements. If you have any projects or part designs you would like reviewed for aluminum die casting please send your prints or 3D files to Sales@diecasting.com for a free evaluation and quotation.